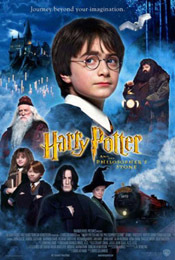 It's kiddie weekend at the movies, with this year's likely biggest box office gun, Harry Potter and the Sorcerer's Stone (Philosopher's Stone for everywhere outside the US), coming in to town to claim top spot from Monsters, Inc. Box office records of all sorts have the potential to fall, with one already gone; Potter premieres in 3,672 venues, a slight increase on the previous record of 3,653 held by Mission:Impossible 2. It's obviously important for the film to reach the largest audience possible, however, I don't think this slight edge in venues will be the deciding factor for a record breaking weekend. To put it plainly, the demand must be there, something Potter certainly has, with its many weeks its book had on the best seller lists speaking for itself. Two major concerns must be addressed when speaking of its box office potential for this weekend, running length and low-aged target audience. The concern over the former should be obvious, as longer running times lead to fewer screenings per day of the film. To address this matter, Warner Brothers has produced an unprecedented 8,000 prints of the film to distribute to theatres around the country, meaning the average theater that receives it will be showing the film on two of its screens. This doesn't seem all that impressive until you consider that there are still many theaters out there that don't have enough to show one screen of each of the top ten. This will combat the 'limited' availability problem as well as giving Potterites multiple time options for seeing the film. While sellouts will naturally present themselves, the sellout problem should be minor. The relatively young average age of the theater-goer factors in with the ticket price; a bulk of the viewers, or at least a far higher number than for an average movie, will be paying less than full price for their tickets. While this could hold back the film's prospects somewhat, it shouldn't be a huge factor. Monsters, Inc.'s performance two weeks ago plainly proves that a film targeted towards a younger demographic can play with the big boys of summer, as it were. Any film hoping to reach these lofty heights must attract viewers from all ages anyway (with this spring's R-rated Hannibal looming large as an exception). For this I reduced my estimates only 10-15%. A third question that may in fact be answered this weekend is, "What is possible? ", both for a day and a weekend. $28.54 million exists as the single day record for The Phantom Menace's Wednesday opening. It should be noted that approximately $7 million of this exists due to midnight screenings on that day, in practically every theater it showed in, something Potter isn't going to have to any great extent. So now the Friday record to shoot for becomes Planet of the Apes' $24.61 million. I think that it's ultimately going to fall short of this mark, as the real strength of Potter is going to be in its Saturday and Sunday matinee performance. A $30+ million day is quite probable for Saturday if the number for Friday is over $20 million, and a near certainty if it's over $22 million. The record for a Sunday is $25.6 million, set all the way back in 1997 by The Lost World. Here, Potter will again come close but not quite break the mark, coming in at the high $24 million mark. Add all three days up and you get $76-79 million, and one impressive start to a run that will include the lucrative Thanksgiving weekend. Almost an afterthought is Monsters, Inc's third weekend, which some have concluded is about to get swamped and could lose all manner of business. There isn't, quite frankly, a lot of evidence to support this theory. The most analogous situation is when The Phantom Menace was released. The film in first place the weekend before that, The Mummy had a second weekend drop of about 42%. With George Lucas' behemoth in play, it dropped 44%. Hardly a competitive disadvantage. Other films had a more noticeable drop, but were making much less actual dollars, making any effect negligible in real terms. The only real problem MI might face is in losing screens being cleared out for Harry Potter and crew; however, Disney has seen fit to secure an extra 200 or so venues for the film, hoping to at least hold their own (I can only surmise that many of these theaters won't be ones showing Potter). After an outstanding 27% drop last weekend, I predict that while Monsters, Inc may lose some business, it will not go out quietly, earning a very strong $27-28 million for its third weekend, placing it around $160 million at the end of the frame. Shallow Hal performed very well in its opening frame, with a solid $22 million. Unfortunately, that's only good enough to make it the third choice this weekend. It could definitely find a niche for those adults hoping to avoid throngs of youngsters, or teenagers who're "too cool for wizard school." Word of mouth on this film has been middling to good, which probably isn't good enough to turn it into a breakaway hit. Look for a 40-45% drop this weekend, with a recovery on Thanksgiving weekend with the extended weekend giving patrons more opportunities to check it out. Not to be forgotten is Snoop Dogg and Dr. Dre's film The Wash, opening in a typical 749 venues. Also typical is its Wednesday opening, with the number coming in at $488k, enough to make it the 2nd highest per venue average of the day. This won't last through the weekend, naturally, as Snoop Dogg's recent film Bones had a similar opening Wednesday but managed only 2.8 million for the weekend. Don't expect anything more than 3 million for the weekend with this one. Last week, Life as a House expanded into the top ten; this week the French film Amélie gets its chance to do likewise, albeit on a more impressive scale. After an extremely successful prestige weekend venue average of $45,490, last weekend's expansion to top 20 markets gave it a still very healthy $16,122 average in 48 venues. This weekend see another expansion to 163 theaters, which, combined with a weak lower rung of the top ten, gives it an opportunity to make headlines, or at least mention in major newspapers across the continent. This could be a very crucial weekend for any further expansion possibilities.